Brigadier General Rosenham Beam has more than 35 years' military service, including two years as a seaman with the U.S. Navy, four years as a Second Lieutenant in the Kentucky National Guard, and almost 29 years as an Air Force officer. 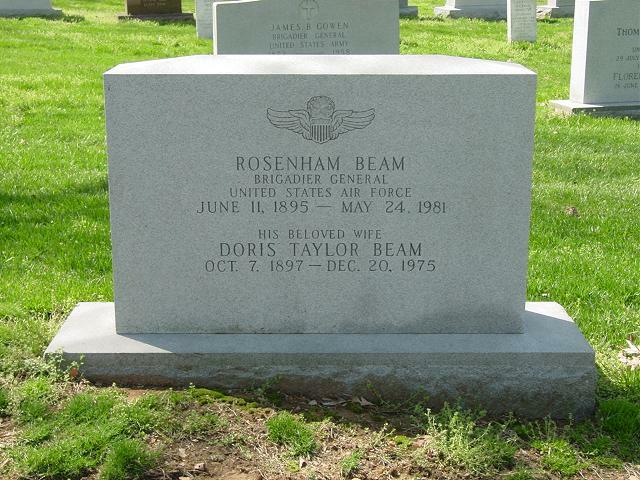 General Beam was born at Bardstown, Kentucky, in 1895. At the age of 18 he enlisted in the Navy and two years later was discharged. In June 1916, he was commissioned a Second Lieutenant of Infantry in the Kentucky National Guard, with which he served for four years. He was appointed a Second Lieutenant of Air Service in the Regular Army on July 1, 1920, and that same date was promoted to Captain. His first assignment was at Camp Knox, Kentucky, where he served until September 1922. He then entered the Air Corps Tactical School, from which he graduated a year later. He then went to the Philippine Islands, where he served successively as operations officer and commanding officer of the 28th Bomb Squadron and as commander of the Fourth Composite Group. After returning to the United States in December 1925, he was assigned as commanding officer of the 41st School of Squadron at Kelly Field, Texas. The following October he was designed executive of the Air Corps Training Center at Duncan Field, Texas, and in July 1927, became commanding officer of the 11th Bomb Squadron at March Field, California. In January 1928, he became commander of the U.S. Air Corps Mission to Cuba, with station at Havana, where he remained until July 1931. At that time he returned to the United States to enter the Command and General Staff School at Fort Leavenworth, Kan., from which he graduated in August 1933. He then became an Air Corps instructor at the Cavalry School at Fort Riley, Kansas. In January 1935, he was assigned to the Office of the Chief of Air Corps at Washington, D.C., as chief of the Plans Division. He later was appointed war plans representative for the Air Corps, and in March 1939, went to Hickam Field, Hawaii, to become operations officer for the 18th Composite Wing. Soon afterward he was appointed commanding officer of the Fifth Bomb Wing at that station and in July 1940, was transferred to the Inspector General's Department in Hawaii. He returned to the United States in April 1941, for assignment as inspector of the First Air Force at Mitchel Field, N.Y., and the following January became commander of the Ninth Air Force at New Orleans, Lousiana. Four months later he transferred to headquarters of the Third Ground Air Support Command at Birmingham, Alabama. In September 1942, he was placed in charge of the air support of General Patton's Western Task Force in the North African campaign. During this time he commanded the Fifth Army Airborne Training Center and supervised the training of the 82nd Airborne Division before it went to Sicily. He also took charge of the air security of the Anfa Conference at Casablanca. In April 1943, he was appointed commander of the Western Moroccan Composite Wing of the 12th Air Force. For his outstanding services in the latter position, he earned the "Lion Tamar" Medal (The Moroccan Legion of Honor) which His Majesty, the Sultan, presented to him personally at Rabat. In August 1943, he returned to the United States to become commander of Perrin Field, Texas, and a year later was appointed commanding officer of the 80th Flying Training Wing at San Marcos, Texas. In March 1945, he moved with the 80th to Ellington Field, Texas, and assumed additional duty as commander of the 34th Flying Training Wing at Midland, Texas. He was named commanding officer of Sheppard Field, Texas, in November 1945, assumed command of Boca Raton Field, Florida, the following July, and in October 1947, became commander of Lowry Field Colorado. In October 1948, he was assigned to Caribbean Air Command headquarters at Albrook Air Force Base, Canal Zone, and shortly afterward was appointed chief of staff and deputy commander of the command. He assumed command of Caribbean Air Command in October 1949, and in December 1950, he was assigned to Air Force Headquarters. The following June he became a patient at Walter Reed General Hospital, Washington, D.C.
General Beam has been awarded the Legion of Merit with oak leaf cluster, Air Medal, Cuban Medal Militaire, and the Moroccan Legion of Honor. Rated a command pilot and aircraft observer, he has more than 5,000 hours flying time.